New research published this week in the Proceedings of the National Academy of Sciences shows that partial ice shelf collapse in Antarctica could make what are major, rare flood events today common in the coming centuries. And the extreme floods of the future will reach unimaginable heights, submerging streets and swallowing buildings. The findings show that climate change has already made flooding much more common in the city. A Sandy-level flood used to have a 0.02% chance of occurring, back in the early 1800s. The foot of sea level rise since then increased the odds of Sandy to 4% in a given year. By midcentury, such of a flood event will have a 20% chance of happening in a given year. 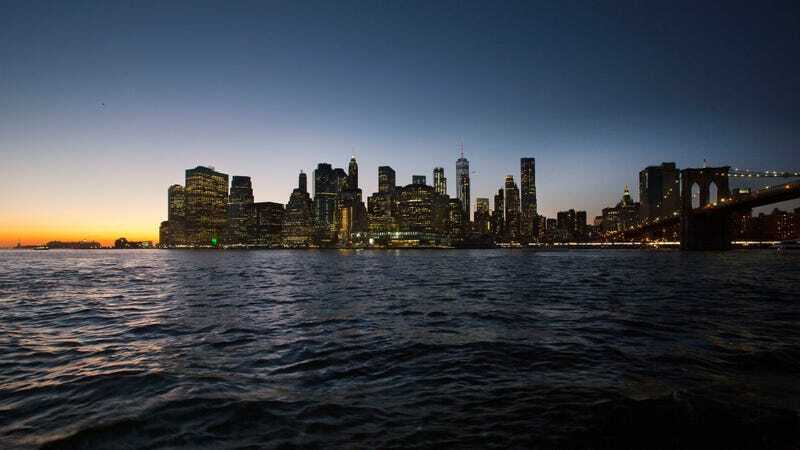 When the researchers projected sea level rise out to the end of the 2200s, they found that what was once an extreme flood that knocked out the subway and power to Lower Manhattan is likely to be the new permanent state of the city. Then there’s the new extremes future New Yorkers will have to deal with. If carbon pollution continues on its current trend, a 1-in-500 year flood—a flood that has a 0.2% chance of happening in a given year—will reach a height of 13.1 to 16.7 feet by 2100, up from 11.1 feet today. By 2300, the 500-year flood height could reach from 16.5 feet all the way up to a whopping 50.5 feet, inundating traditionally high ground and requiring bodega cats to be outfitted with floaties. “Some of the results that we found with this work were really quite staggering,” Andra Garner, a postdoctoral researcher at Rutgers who led the new study, told Earther. Garner and her colleagues also modeled how climate change could alter storm tracks. They found that while there will slight shifts in hurricane tracks and intensities, sea level rise is what will ultimately be the biggest driver of flood risk in New York out through at least 2300. You may be wondering why it’s worth modeling our future that far into the future. After all, you and I and everyone else on this planet will be long dead and gone. But looking that far into the future isn’t just a thought exercise for scientists with computing time to burn. Our decisions in the next few decades will set the planet’s course for centuries to come. That’s because the climate system takes a long time to reach equilibrium and the impacts of carbon emissions today will ripple out far into the future. When it comes to Antarctica’s ice, the effects could be particularly dramatic. The scientists modeled how rising ocean temperatures could undercut parts of the massive floating ice shelves that extend from the ice sheet out into the sea. Warm oceans have already started cutting deep into the ice shelves in West Antarctica. Going deeper could eventually lead to ice shelf collapse in that region, and a rush of land ice into the oceans, pushing sea levels much higher (and potentially very rapidly). The research’s high end sea level rise estimates include this partial ice shelf collapse. A growing number of studies have shown that parts of West Antarctica are near the point of no return, though it’s not a given just yet. That’s no reason, however, to ignore this possibility. In New York, decision makers are already on it. The city started a $20-billion effort to up its flood protection game after Sandy, although it still has a long way to go. Other cities are also being equally proactive from South Florida to the Bay Area. The choice to plan ahead now doesn’t just benefit future generations. Climate change is already fueling a coastal flooding epidemic. More than three-quarters of the coastal floods in the U.S. from 2005-2014 were due to rising oceans, and the adaptation choices being made today have real, immediate benefits. But adaptation isn’t ultimately going to save humanity from 50-foot floods. The only way to deal with that is to for the world to start cutting its carbon emissions now.